With the opening of its new offices in the Medical Science Center, 1300 University Avenue, the Global Health Institute moves into the heart of campus and expands its presence as a cross-disciplinary center for global health innovation. “The move allows us to further serve our colleagues, students and researchers, especially those not on the health science campus. With the new space, we’re able to truly foster the kind of cross-disciplinary innovations in global health we know this campus is striving for,” said Director Jonathan Patz. The Institute’s new offices are in Room 1010 in the west wing of the Medical Science Center, just north of the Wisconsin Institutes of Discovery and east of the Wisconsin Energy Institute. Faculty, staff, students and fellows will find space for spontaneous discussions and action-oriented problem solving. GHI is dedicated to addressing the multi-layered causes of health and illness by fostering interdisciplinary strategies and forging partnerships with communities in Wisconsin and worldwide to improve health and well-being. About 300 undergraduate and 70 graduate students pursue global health certificates each year. The Institute also manages international clerkships and independent studies for 100 students annually. The GHI Advisory Committee includes more than 60 faculty and staff members from across campus. The Institute was designed to be a portal for campus global health activities and a catalyst for complex problem solving, assistant director Jake Moskol said. “Just knowing our stakeholders have a place they can go to spread out and interact with their peers and our staff is a huge asset,” he added. The new center includes faculty offices, room for group meetings and a place for everyone interested in global health to meet and discuss ideas. 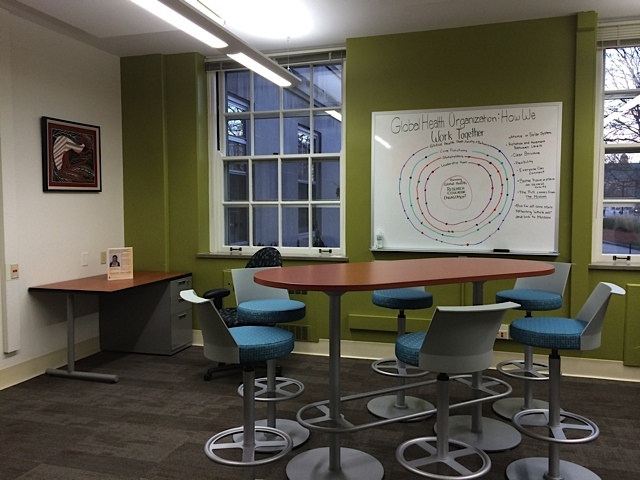 A Fellows Space includes five desks for future global health fellows as well as a table and white board for global health students and colleagues to meet and work. A large conference room will be used for formal meetings and presentations. GHI also will maintain its current office in the Health Sciences Learning Center, Room 4256. The Global Health Institute was created in 2011 by the merger of the university’s Center for Global Health and the Global Health Initiative. It resulted from the campus-wide self-assessment for the institutional reaccreditation process that identified global health as a part of the UW-Madison’s shared mission. In addition to educational opportunities, the Global Health Institute, supported by public and private funds, also sponsors student, faculty and visiting scholar awards and hosts speakers and other events throughout the year. The Institute celebrates the opening of its new offices with a reception and conversation for students, colleagues and friends from 4:30 to 6:30 p.m. Tuesday, November 19, in Room 1010 of the Medical Science Center, 1300 University Avenue. A short program begins at 5 p.m., and light refreshments will be provided.